Palate: Very much as on the nose except sans the gasoline, and with some minerally notes in its place. That musky lime is more fresh and effervescent here. Gets a little more bitter (lime zest) on the second sip and there’s also some sweetness on the tail. Not much change after that. Let’s add some water. No, that doesn’t do much good–more than a little soapiness emerges. Maybe a hint of tropical fruit at the very end. Finish: Long. That combination of the bitter lime zest with the sugary edge lingers and edges into some musky malt as it fades out. Not much wood at all. The bitterness gets soapy on the finish as well. Comments: There’s very little sherry character here–must have been a very tired cask. Don’t get me wrong, while this isn’t anything great, far from it, it’s quite drinkable. But it doesn’t taste particularly old and, indeed, is my least favourite of the four I’ve had. Still, even though this drags down the average of the four I’ve had so far I’d still say that the low reputation of the distillery seems outdated. A very clear through line between the four I’ve had so far, by the way: musky lime, maltiness, a lightly bitter edge. 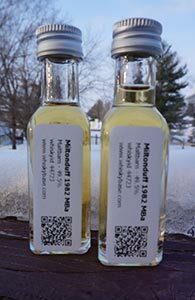 This entry was posted in -Whisky by Rating, 80-84 points, Maltbarn, Miltonduff, Whisky by Bottler. Bookmark the permalink. Serge reviewed this one recently. I know it’s very weak-minded of me but I am always pleased when I get to something before Serge and then his notes end up being reasonably close to mine. I have tremendous respect for his palate and so these rare occurrences feel like corroboration/reassurance.